"Shirley Lucille Dow and Sandra June Roberts, Westbrook College, Class "
Westbrook College students Shirley Lucille Dow and Sandra June Roberts, Class of 1978, lived in McDougall Hall. Shirley was a Fashion Merchanding major, and Sandra was a Medical Assisting major. For their senior class candid photo, which appeared in the 1978 Tower Yearbook, they wore light colored winter jackets with fur-lined hoods, slacks and mittens. 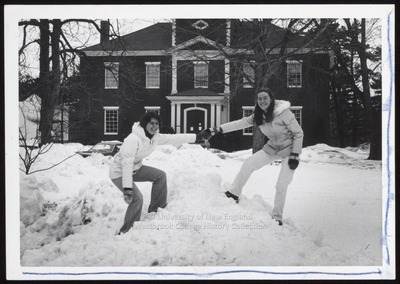 Shirley and Sandra straddle a snow bank, one on each side, with mittened hands linked. Alumni Hall and a barely visible automobile are behind them.